Generally I’ve always been happy with my weight. I’ve never been overly skinny nor have I been extremely over weight (for my BMI). However recently I’ve noticed I’ve put on a little more weight than I feel comfortable at so I decided to take to the internet to look for something that would help push me along a little bit. I was so pleased when I was recently given the opportunity to take part in a Bloggers Love event. It was a fantastic opportunity to network with fellow bloggers and to have the chance to work with some amazing brands. 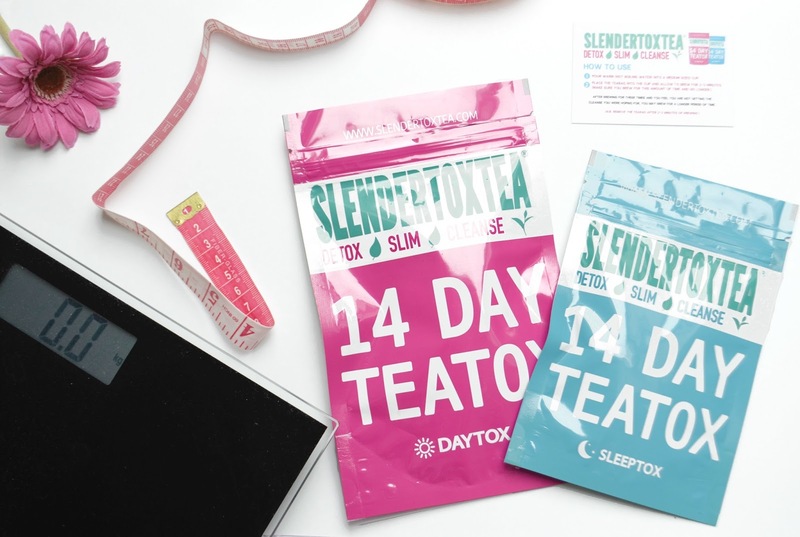 I was kindly gifted SlenderToxTea‘s 14 Day Detox to try for myself. Included in the package was a 14 day supply of Daytox tea to be taken every morning and Sleeptox tea which was to be taken on alternative nights. The Slendertoxtea Daytox teabags contain hawthorn grain, red bean, sterling bean, radish leaf, camellia flowers & seeds, green tea and fennel seeds to cleanse the colon, increase energy and promote a healthy change. The Sleeptox teabags contain the same ingredients with the addition of valerian root which aids sleep. The ingredients seemed a little bit vague but surely there can’t be too much else in a teabag? I had been drinking fennel tea for a while and I didn’t mind the taste so I was intrigued to see how this would fare in comparison. Unlucky for me, it tastes pretty much exactly like green tea, which I’m not a fan of. An easy tip to help you drink it if you’re having difficulty is to let it cool all the way down and then drink it in one go. It is advised that you start the teatox on your day off and after giving it a go, I can completely understand why. I started off with the Sleeptox and by the enxt morning my system was ready for a huge clear out. I brewed the tea for exactly three minutes so I know I didn’t go overboard. I experienced slight cramping towards the end of the first evening and for the next three days. I had read some pretty awful (and graphic) reviews so I was fully informed and prepared and in all honesty, it wasn’t as bad as I had thought it may be. After the first two days I started brewing the tea for just two minutes. I thought it worked better for my insides and my cramping had subsided this way. I’m 7 days into the detox and I have to say, surprisingly, I’m liking it. I think it’s important to remember that the tea isn’t for weight loss but it aids weight loss. I’ve noticed that since drinking the tea, I’ve become more aware of things I’m eating. That sneaky little chocolate bar that I would later completely forget that I ate was no longer being touched and I felt motivated to help the Teatox along by taking the stairs rather than an escalator. I must admit, I haven’t been exercising much at all but due to the amount of times I visit the little girls room, I’ve tried to drink more water to compensate for it. For someone who hates drinking water, this is big! Rather than feeling more energetic, I would I have definitely been more motivated. It’s also helped my attempt to wake up a little bit earlier so that I have time to drink it before I leave for work. 7 days in and the scales are saying I’ve lost 4.5lbs, which to be honest, for me isn’t amazing nor is it very noticeable. My weight is up and down like a rollercoaster normally but I’m still only half way through so I’m optomistic. I am hoping that it carries on decreasing and who knows maybe I can lose half a stone? Wishful thinking anyone? Having read a lot of reviews, I saw that the majority of people that actually stick the detox out are able to see proper results just before their 14 days are over so fingers crossed it will be that way for me too. All in all, I think Slendertoxtea is a great product when used properly. If you’re having trouble finding the motivation to kick start your healthy eating/lifestyle change or just feeling bloated then I’d say give it a go. NB: One thing that is often overlooked and needs to be stated a little more clearly is that when your on any kind of Teatox, your contraceptive pill will be affected! Always remember to read the FAQ‘s before your teatox. For an opportunity to be gifted some amazing items and work with a range of different brands, visit the Bloggers Love Hub here.